The news you need to start your day. The biggest stories and ideas – from politics to pop culture – in ten minutes. The timing for me is just right. Ten minutes is about the time it takes me to eat my bowl of cereal and drink my cup of coffee. While I like the podcast (it is more news than Fox and Friends or Morning Joe), it is the ad for the show which caught my attention. In it the announcer lists all the tasks you cram into the limited amount of time you have in the morning. Get the children up and off to school. Get yourself out the door. All in the time you don’t have. There is only going to be one day in my life when I run out of time. Until then, the time allotted to me is mine to decide how I will use it. I can be busy and run out of time, rushing from this moment to the next. I can push the kids out the door and onto the bus. I can race from here to there and back again. Or, I can be busy, but still pay attention to the moment at hand. To the person in front of me. To the concern that lingers. Looking back, my regrets often have something to do with thinking/imaging I did not have the time. I wish I could recall and do over some of those moments. The issue for us is not our busyness. But how we chose to live in all those busy moments. O God, this I ask. To do more than the next thing on my list. Or, to rush from one interruption to the next. Of those whose lives intersect mine today. That I otherwise might miss in my haste. In the sacredness of this moment. May I chose wisely and well. Help me be mindful of my own life. Given to me this day as a gift. 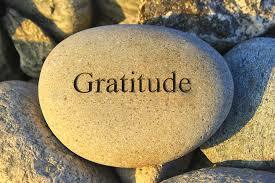 That gratitude might weave its way through each moment. A card with that saying on sits on my desk. And, truthfully, every day I try to say Thank you. Sometimes it is a pretty perfunctory prayer for food enough and for the relationships which sustain my life. Other times my prayer comes from a deeper place. The events of the day or chance phone call or email touch something within me and pulls a deeper sense of gratitude to the surface of my life. While I try to say Thank You each day and regularly remind others to do the same, today I learned something new about gratitude. I learned that gratitude is hard. It means stopping long enough to pay attention. It means seeing who and what is around me. It means pushing beyond the narrow confines of my shrink wrapped life. It means making space and letting go and opening up all of which is risky. And, I used to think it was so easy…..